Successfully Added Xiaomi Power Cable Storage Box - Detachable Cover, Big Cable Mouth, Good Heat Dissipation, Multifunctional Design to your Shopping Cart. With this power cable storage box from Xiaomi, you will be able to keep all your cables organized at one place without creating a mess. Anybody out there that uses many electronic devices such as laptops, tablets, and smartphones, knows the annoyance of having an overflow of power cables in your room. Not only do they make your room look messy, they may also form a risk as they could cause you to trip and fall over. 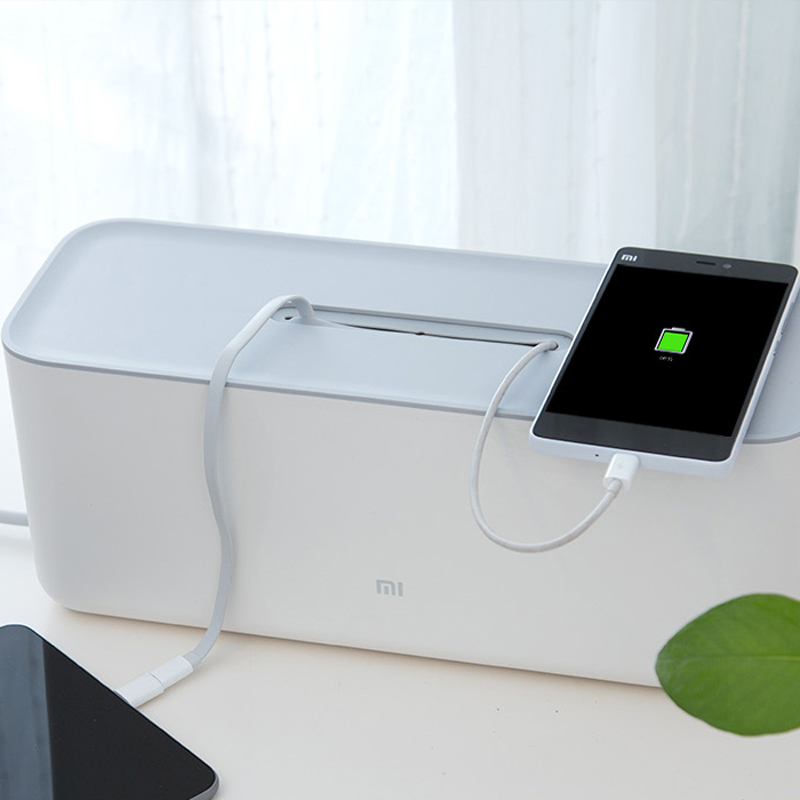 With this stylish power cable storage box from Xiaomi, however, all these problems will be an issue of the past. With this amazing accessory, you will be able to store a power strip along with a large number of cables – ensuring that you’ll always have the needed power cable at hand without creating a mess at home. Thanks to its detachable cover, you will be able to conveniently place all your power cables inside the box. Featuring 3 cable mouths at the top and 2 large holes at the side, there is enough space to efficiently use this stylish cable box to store and use up to 5 different power cables at once. This Xiaomi accessory features a great heat dissipation design at its bottom, providing safe usage and taking away any overheating or fire risk. Its truly multifunctional design makes this storage box suitable not only to be used for power cables, but also for regular office appliances such as pens, scissors, rulers, or other small sized electronic gadgets. This Xiaomi Power Cable Storage Box comes with a 12 months warranty, brought to you by the leader in electronic devices as well as wholesale electronic gadgets.. Suitable for power-strip, cables, pen, ruler, scissors, card, small gadgets, etc. Arabic: - صندوق تخزين - Chinese Simplified: - 储物盒 - Czech: - Úložný Box - Danish: - Opbevaringsboks - Dutch: - Opbergdoos - French: - Boîte de rangement - German: - Aufbewahrungsbox - Hebrew: - תיבת אחסון - Hindi: - संग्रहण बॉक्स - Italian: - Scatola di immagazzinaggio - Japanese: - ストレージ ボックス - Korean: - 저장 상자 - Malay: - Kotak storan - Norwegian Bokmål: - Oppbevaringsboks - Romanian: - Cutie pentru depozitare - Russian: - Ящик для хранения - Spanish: - Caja de almacenaje - Thai: - กล่องเก็บของ - Turkish: - Saklama kutusu - Vietnamese: - Hộp lưu trữ.